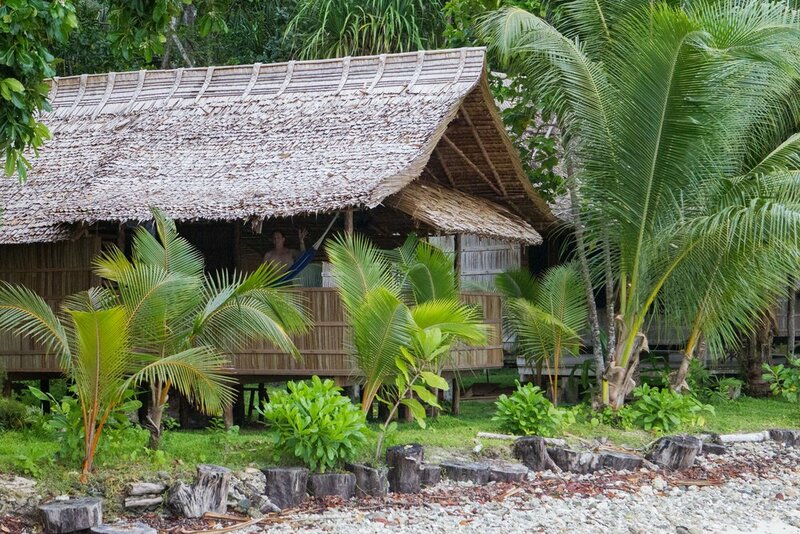 All Bungalows at Papatura Island Retreat are constructed using traditional materials such as sago leaf and wild beetle nut, all have large decks facing the Isabel mountain range and are a few steps back from the gorgeous white sandy beach and crystal clear water. They are tucked away between the coco palms, orchids and local plants, all fitted out with LED lighting, inner spring mattresses, mossie nets, pedestal fans and 240v Australian power outlets. Bath towels are supplied but please bring your own toiletries. We do have 1 porta-cot available for those with babies so please reserve when booking. With amazing views of the wild dusk sunsets and falling asleep to the gentle lapping sounds of waves would you rather be anywhere else? The 3 family bungalows are our largest bungalows which sleep up to 6 guests, split level with a queen bed and 3 singles all with mossie nets (if required can alter bedding arrangement to accommodate for larger families). It has a very unique and private indoor/outdoor bathroom with toilet, basin and warm water shower. The huge deck area with waterfront views is enclosed making it the ideal bungalow for couples, groups or families with young kids. The bungalows have 240v power points, LED lights, fans and a small fridge.